Each $32 box contains 24 packs. Each pack contains 10 cards. There are 55 new stickers in the Wacky Packages Series 10 base set. 27 of the card backs feature a mix of 9-card puzzles. 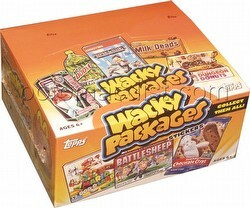 27 of the card backs feature new Wacky Billboard and Movie poster advertisements and Wacky product coupons. Also look for 10 different Awful App stickers, 9 As Screamed on TV, 10 Magnet cards, and 10 Tattoos, as well as Sketch cards and Parallels (Blue, Silver, and Gold)!